Tetteh in front of the CCC offices in northeast Portland on Monday. 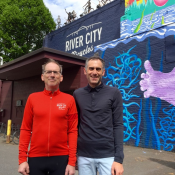 Community Cycling Center CEO Mychal Tetteh will leave the organization later this year for a new a position with the City of Portland Bureau of Transportation. Tetteh, 34, has been hired by PBOT to manage the Fix our Streets program. Tetteh has been with the CCC since 2005 when he got his start in the organization’s retail bike shop on Alberta Street. He was hired as CEO in August 2013. In his new role with PBOT Tetteh will oversee the implementation of a four-year, $64 million transportation infrastructure funding program that resulted from the 10-cent per gallon gas tax increase voters approved back in May. In an interview yesterday, Tetteh said he’s proud of what the CCC has accomplished during his tenure. On the top of his list were the organization’s refreshed brand, stronger partnerships, a “deep commitment” to equity and inclusion, and increased investments in underserved communities. Tetteh said their summer bike camp program for east Portland youth will grow from 20 to 125 scholarships next year. The CCC’s efforts to improve bicycling access by people of color and those with lower than average incomes started before Tetteh took the helm; but it laid a strong foundation for some of his most important work. 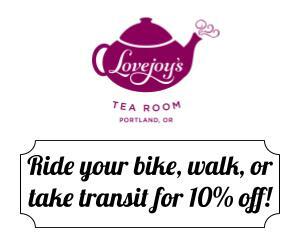 The organization began working with the New Columbia neighborhood in north Portland as part of their groundbreaking Understanding Barriers to Bicycling project in 2009. Since then the CCC has build a bicycle skills track and a bike repair shop. Most recently they won a federal grant through Metro to offer the Safe Routes to Schools curriculum to every child in nearby schools. Tetteh at the launch of bike share in January 2016. Pushing for cycling to be accessible to everyone, “No matter where they come from or their walk of life,” is a passion for Tetteh. 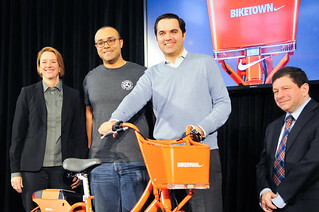 During his tenure the CCC became a key partner of Biketown, Portland’s bike share system. After winning a grant for reduced-fare memberships, Tetteh helped launch the ‘Biketown For All’ program last month. 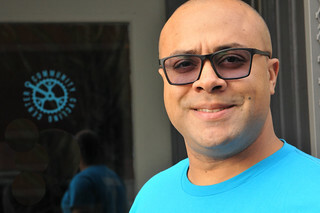 The CCC bike shop, which Tetteh used to manage, is a model for community bike shops. 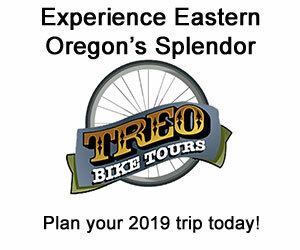 In addition to a shop environment where all people are welcome (not a common thing in the bike industry unfortunately), the CCC’s retail store offers special discounts for low-income customers (with an Oregon Trail or MedicAid card). In many ways, the shop is the most tangible expression of the CCC’s values that were strengthened during Tetteh’s three years as director. Tetteh’s departure is one of three recent staffing changes at the CCC: Routh became communications and marketing manager in September (she was executive director of Oregon Walks from 2008 to 2013); and volunteer and event manager Patrick Loftus (who had been with the organization since 2009), is also moving on. Tetteh will start at PBOT immediately after the New Year’s holiday. The CCC expects to have an interim director in place before the end of this year and a new leader in place by March 2017. Tetteh seems like a great guy, and this sounds like great news! Does he have any transportation or engineering background? Did he have anything to say about how he plans to approach his new position? That makes a lot of sense, thanks.He sounds like an amazing choice for the job and I wish him the best. Mychal, we’re so fortunate to have smart people as dedicated as you stepping up for continued public service. Thank you for what you have done and will do, and congratulations on your move. More people like this in PBOT, please! Awesome news, I’ve been a huge fan of his work and passion since meeting him back in 2009 or so. He’ll continue to do great things and we’re lucky to have him.